After mounting the tires with inserted valve insert, fill with air. At 1 bar (14.5 psi), check whether both beads are seated correctly. If one of the beads is not seated correctly, do not deflate air from tire but rather position the assembly roller on the affected beat and press on by rotating slightly. The bead then seats itself. Then continue filling until the tire pressure recommended for the vehicle is reached. Tires can also be filled with tire filling gas as with conventional tires. 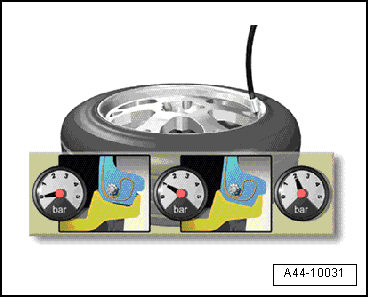 Do not briefly overinflate tires to 3.5 bar (50.76 psi) as is common with conventional tires.